We offer accommodation in a house situated in Ořechovka, one of the most beautiful areas of Prague which is famous for its many fine villas. 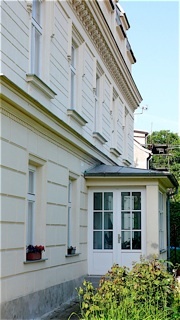 Václav Havel, former president of the Czech Republic, had his private house in this section of Prague, and it includes the residences of many foreign embassies and staff. 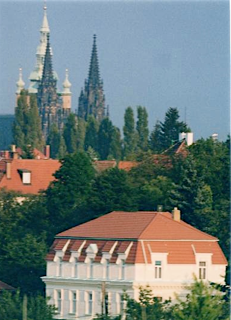 It is a pleasant and easy twenty minute walk from Pension Jana to Prague Castle. From there, it is possible to continue walking down through Malá Strana, across Charles Bridge to the Old Town Centre, and on to Wenceslas Square (about another twenty five minutes). For those who prefer to travel on famous Prague trams, it is a short walk up the hill to the number 18, or down the hill to the 26. Both these trams go into the centre of the city. It is also possible to connect with the excellent metro system with these trams. After midnight, it is necessary to use only the Night Trams which run every 30 minutes. As a matter of course we can arrange public-transport tickets, theatre bookings and more.